A well-preserved home, Beekman house reflects the lifestyle of a well-to-do 19th-century businessman. 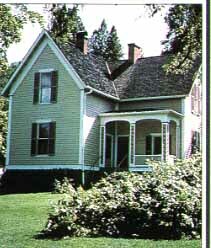 The 1875 house contains original furnishings. It was the home of Cornelius C. Beekman, gold freighter, Wells Fargo agent and banker. Beekman's progress from apprentice carpenter to founder of the second bank in the Pacific Northwest is a classic pioneer tale.